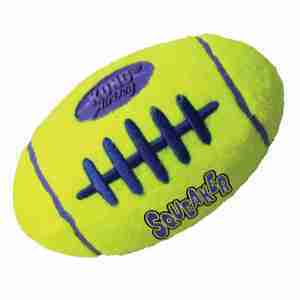 The KONG Air Squeaker Football combines two classic dog toys, the tennis ball and the squeaker toy and puts them together in an instantly recognisable football shape to create the perfect fetch toy. This durable, high quality toy will not wear down your dog's teeth as it is made with a special nonabrasive felt, compared to the abrasive material found on normal tennis balls. Do not leave toy unattended with animals that eat toys. Follow all directions included in package. My smooth collie has had his for more than 2 years, and it's still in fine condition. He absolutely loves it. Perhaps some dogs need to be reminded that fetch toys are not for chewing. I bought this ball couple of times and the dogs really love it! it's very well made and big size for a large dog, the only weak point I see is that the tennis ball material on the ends comes off easily. Absolute waste of money. In less than an hour our 1 year old dog had chewed the oustide coating.